The 2009 International CES opened with the world's largest debut of consumer technology products, and keynote addresses from industry leaders. 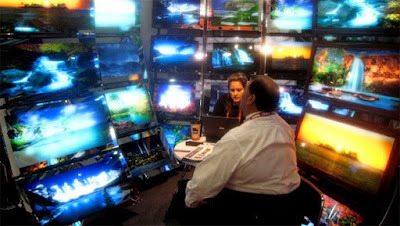 The world's largest tradeshow for consumer technology, runs through Sunday, January 11 in Las Vegas, Nevada. Sony's president and CEO, Sir Howard Stringer, kicked off his opening keynote address at the 2009 International CES by unveiling the "CES Seven" -- key imperatives for creating the critical user experience. These included the concepts that products should interact seamlessly across industries, be service-based, multi-functional, support open technologies, advance the new shared experience, create new value chains and be green. Stringer said that Sony intends to create the total Sony experience so that by 2011, 90 percent of Sony's product categories will connect wirelessly to the Internet and to each other. To help illustrate Sony's cross-platform entertainment strategy, offering content and services at home and on the go, Stringer was joined onstage by a variety of entertainment stars, including Tom Hanks, Usher, Jeffrey Katzenberg, Reggie Jackson, Dr. Oz and John Lasseter. In addition, Stringer announced a host of new Sony products, including the Wi-fi Cyber-shot camera which allows people to send photos to a networked Bravia TV, as well as to websites, blogs and photo sharing sites and a new Internet-enabled alarm clock, created in cooperation with Chumby, that provides personalized content, including news, sports, weather, music, videos and Internet radio. Stringer also announced a partnership with MTV Networks to deliver 2,000 hours of programming for Sony's Video Delivery Service, a new line of Eco TV products that are 40 percent more power-efficient than current models and the new Sony Vaio P series Lifestyle PC, a full-featured lifestyle PC that fits in a jacket pocket, is wireless and has built-in GPS.